Are You Killing the Media by Turning Your Clients into Red Delicious Apples? I wrote this in 2010 when I worked at a mid-sized PR firm, inspired by an article I had read five years earlier. For some reason I never posted it anywhere. It seems a shame, because aside from the unfortunate use of the word “blogosphere” (was 2010 really that long ago?) it seems pretty relevant, if long by modern standards. Did I miss my chance to warn everyone to the dangers of hyper-PR? In seeking something to blame for the plight of traditional media, this might have been overlooked, so here is the old post, only gently edited. It’s a sizable leap, but it’s a fear that has been dogging me for months. PR people may have created a cocktail of access, news value, messaging and training that lulled everyone into a complacent daze as the news became a stream of pleasant people with a polite, self-serving and ultimately forgettable take on the day’s events. To paraphrase Voltaire, if the blogosphere didn’t exist, we would have had to create it. Consider a crabapple like Andy Rooney before you discount my concern. I usually turn off the TV when he’s on. I assume a lot of people do, but he gets the last word on the country’s most popular news show every week. Even when he has nothing to talk about, he always has something to say. Next time you catch him, I bet you find that in the process of listening to him moan on about coupons or juice boxes, you forget what was said by every corporate spokesperson that appeared in the 55 minutes before him. I am reminded of the story about how the apple industry almost killed itself with Red Delicious apples whenever I listen to spokespeople who wear the marks of recent training and over-briefing. 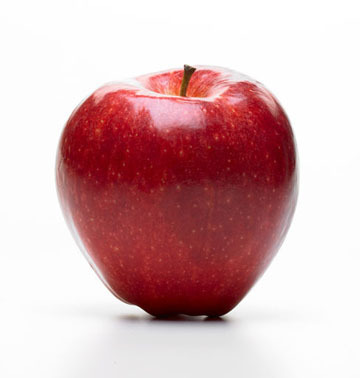 In the late 20th century, forward-thinking apple growers sought to take advantage of unending demand for their best selling variety and bred it for two traits above all others: deliver-ability and visual appeal.After years of careful gene selection, they were left with an apple that consistently grew to a predictable size and shape – rectangular for easy shipping – and reliably matured with an even, radiant skin that was thick enough to keep it fresh for weeks.Red Delicious growers had their perfect fruit – easy for them to deliver and stores to sell. Savvy readers and produce aficionados may have noted two problems. First, the growers didn’t include flavor in their breeding goals. Their perfect fruit tasted like cardboard, and though it got to the market easily and looked fantastic, it was hard to swallow – perfectly destroying the whole point of being an apple. Second, they put stores on the front lines of the battle for taste. When consumers woke up to the fact that their apples were not as delicious as they used to be, they didn’t blame the growers. They blamed the stores and went to specialty markets with better tasting produce. Let’s return to the media industry. It used to be that access to credible spokespeople was limited. PR’s job was to create access for journalists in exchange for some say in the ground rules for that access. While many of our clients are very credible, not all are natural spokespeople. We gave them messages that were deliver-able and appealing (sound familiar?). I fear we forgot the most important part: adding depth to a story while making the issue easier to understand — the flavor. But journalists need sources, and readers kept “buying” them, so we kept refining the messages, breeding soundbites with tough skin to resist editing. Odd and interesting people who said things that might be hard to understand were made to rehearse three messages they should say three times, questions be damned. People outside of senior management were told to refer inbound calls from press to the PR team where questions were directed to our red delicious apple spokespeople. When the readers started noticing they missed the flavor, they didn’t blame the spokespeople. They went to single-sourced, unedited stories from specialty “markets” on the internet and blamed the media for being out of touch. Did we help do that? I really hope not. Again, I believe in PR, and I believe in media training. If the only thing keeping a smart person out of the spotlight is a fear of doling their expertise out in 15 word sentences people will understand, train away. But remember that boring interviews with people who don’t help audiences understand important things better only contribute to the decline of the people we want to help – journalists that take the time to interview our executives. Let’s aim higher, leave some rough edges and let our strange and interesting spokespeople put flavor in the news.